Replaces Apple’s aged time app in the menubar and adds modern time management tools to enhance productivity. 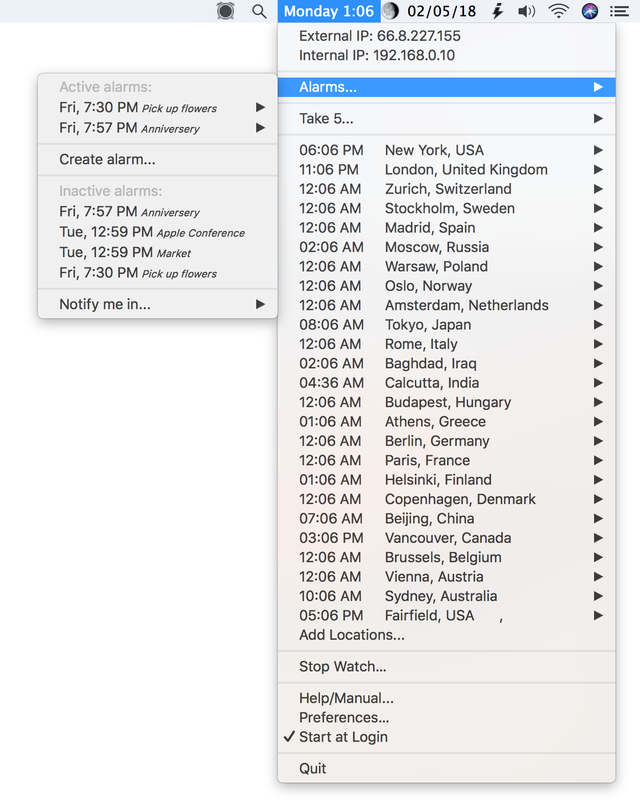 iClock has a drop down menu of the current time/date in any city/timezone in the world. View time & date simultaneously in any format, font or color, instantly view Google or Apple calendar/events right from the menubar, stop watch, countdown clock, moon phase, floating clocks, local ip, date difference calculator, application menu, alarms, global scheduler and ‘Take 5’ (like a Pomodoro timer) to remind you to take a break once in awhile as you work. Laptop alarm (optional) on power disconnected. 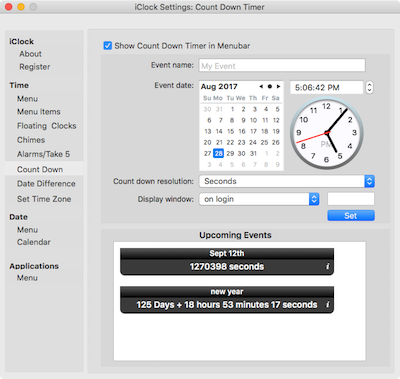 iClock is an essential, easy to use, resource efficient, modern app for Mac OS. More info, video and screenshots below. …And it does so, so much more. "With my line of work, I never know what distant corner of the world my job will take me. iClock's simple, intuitive interface never lets me down. With a quick glance, I can see what time it is where I am....where I'm going...and where I've been. With another click, I can check the weather at my next destination." "Star Wars: Episode I - The Phantom Menace", "The Lost World: Jurassic Park" and many other movies. "I remember thinking 'Why do I want another clock' before I tried iClock. Now I think 'How did I get by without it'." "iClock saves time! Once again I've snagged an invaluable tool from Plum Amazing. iClock elegantly offers just the right balance of functionality and features. 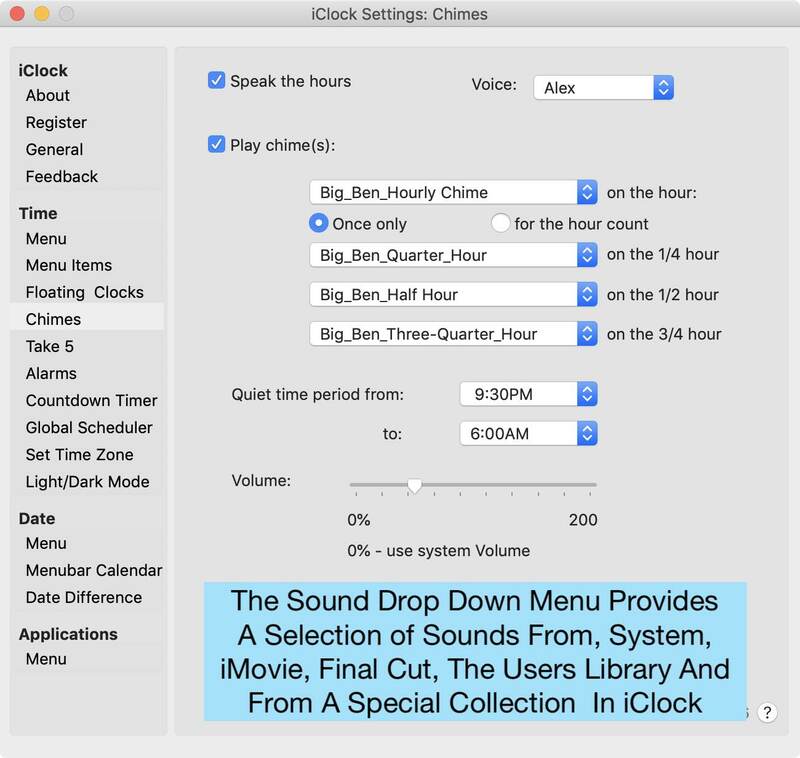 No digging - no bloat; just a wonderfully simple tool to help manage my clock, my time, my Mac." "It's hard to imagine that so much functionality could be packed into a 'clock'!" 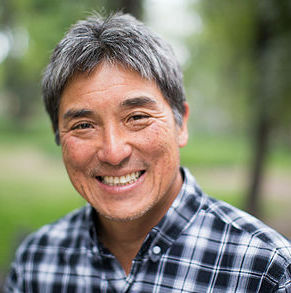 Guy Kawasaki Author, Blogger, Evangelist, and Entrepreneur. "Best time I ever had!!!!" "I love iClock. It's not only attractively designed, it's really useful, too. Besides all its time features, I was delighted when I saw that it restored the drop down menu for open applications." "The feature that attracted me to iClock was the location time menu. When I need to make a service call overseas I need to know what time it is in that country. iClock is simple, non-obtrusive and FAST. Thank you for a very useful yet simple to use program." "iClock is AWESOME! You should really try to get Apple to include it with all their machines! I'm glad I found it. Thanks!" "I couldn't live without iClock now. I love it because it is so simple, but has so many powerful features. I am constantly amazed at what it can do." I am a ham radio operator and I just want others to know that iClock offers useful features for hams. "I like the app iClock. All the features you like and none of the features you don't like"
Take that needed break, with the best pomodoro timer with visual & audio reminders. 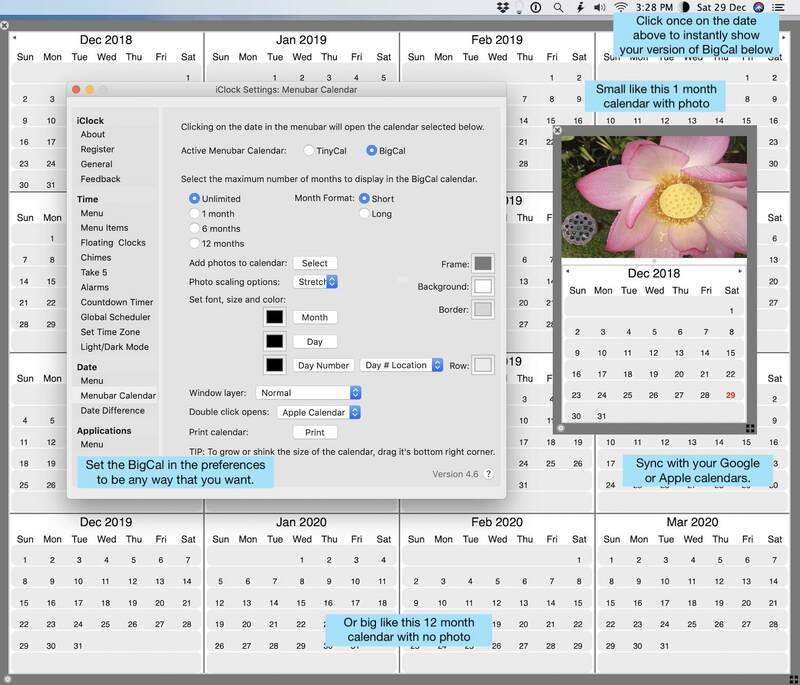 Resizable calendar that you can customize to show 1 to 12 months, add photo, float, embed on desktop or as normal window. Also prints nicely. Automate appearance of Dark/Light Mode with sunset & sunrise or your custom schedule. Set manually from the menubar too. iClock is time, date, alarms, calendars, moon phases, countdown, stopwatch, chimes, floating clocks, pomodoro timers, application menu, BigCal, TinyCal, automation of dark/light mode, global scheduling, world time, laptop alarm and much more. It’s way easier to use than it is to describe. ✓ From the menubar tap the Time to see the local time and important info for any cities in the world in a handy customizable menu. 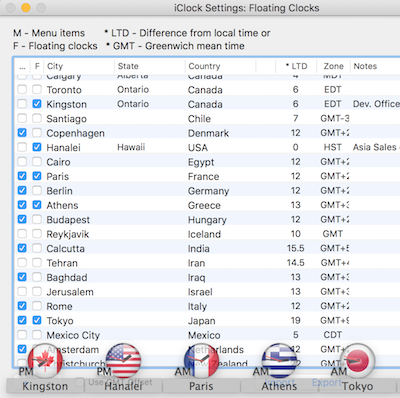 The best world time or world clock on Mac. ✓ Optional laptop alarm. Enable the laptop alarm and get alerted by some powerful alarm sounds when your power cord is disconnected. iClock is about productivity but not just about business! Enjoy moon phases, chimes with sound effects like Big Ben or a cuckoo clock. It’s fun to use. Tap here if you have any questions. - added laptop alarm with new sounds - the alarm detects if the powercable is disconnected then sounds the selected alarm sound. only available for use on mac laptops. we make no guarantee on this alarm will save your laptop. you can test it out yourself. arm the alarm, choose one of the new sounds and pull the cord to see what happens. could be handy for starbucks when you use the restroom 🙂 or maybe it's safer to take it with you. you decide. - new permissions panel. getting permissions automatically brings up the usual dialogs for calendar, location and apple events but this panel will help make sure the correct permissions are available to access features. - fixed month doesn't show in tinycal in dark mode. - added new options for BIGCal. first day of the week can be set. - fix for new login items appearing. if you have more than 1 iclock in login items. quit iclock. 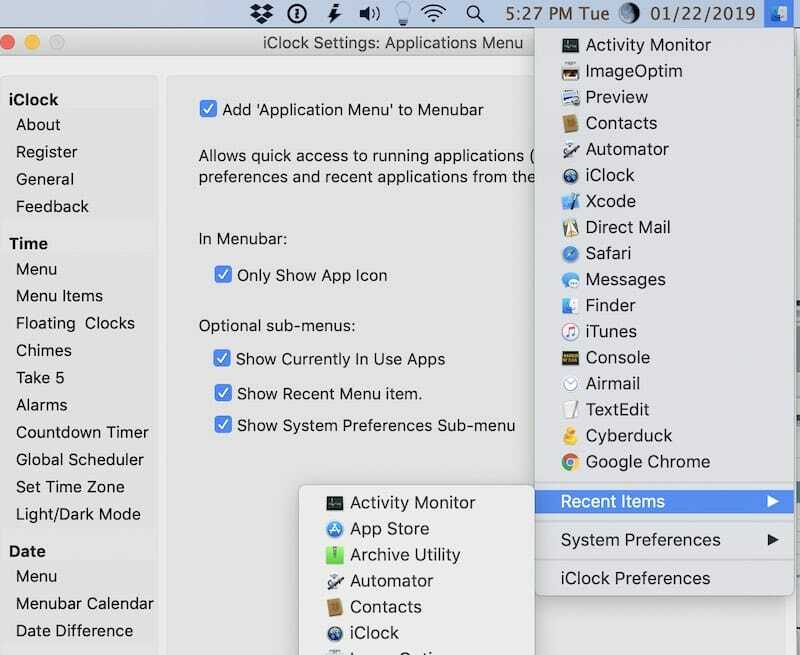 go to system preferences:users & groups:login items and delete all the iclocks there. then launch iclock and in iclocks preferences:general turn on (checkmark) the 'Always launch iClock at Mac startup'. - fix for wrong characters appearing in custom formats. - add none to the choice of calendars. 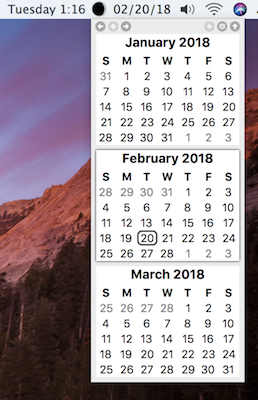 none, apple, google are the choices for a calendar connected to the date in the menubar. if none is chosen then when the menubar date is clicked no calendar appears below. - fixed issue with label in custom formats being changed to a number. - now both analog and digital floating clocks can go all the way to the top of the screen just below the menubar. - reset all button now will totally reset the app back to the default settings. don't push that button unless you want to lose all the customizations, new time & date formats, etc. you have made to the app. it is for situations where you really do want to reset iclock to it's defaults. - the settings for custom date & time now includes more visible ways of using leading 0's to construct new formats. big thanks as always for all the great feedback! iclock just get's better & better. - ip's & internet info refresh more consistently and quickly. - reset all item updated to include all new features. - now all time and date formats can be deleted without causing a crash. 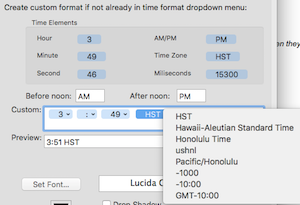 - day options removed from the time formats drop down menu. - lots of other misc. improvements made. thanks to ludo for those last few. thanks for letting others know about iclock it helps us to keep improving it. - solved the unidentified developer signing issue. app will open without extra dialogs. - new prev to show/hide am/pm in floating clocks. 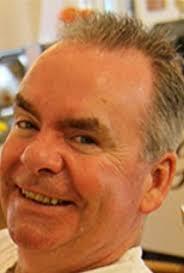 that request thanks to tom quakenbush. yes, that is his real name. he wanted to have on floating clock float on top without anything else. 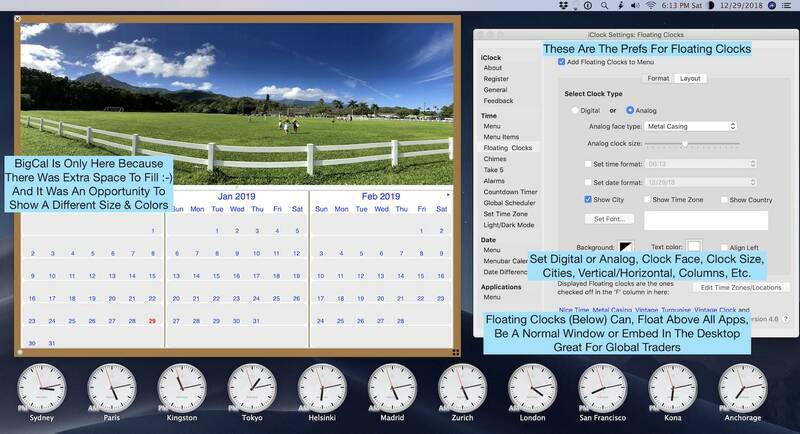 now you can have 1 analog clock on your desktop floating above all apps. it a good addition to iclock. - added swift version number to satisfy apple app store. * you may want to let your friends know if they are just using the apple clock they are kinda missing out. - changes to allow adding commas for custom date and time. - more consistent symetric space between time and date in custom formatter. thanks to ludo for reporting these last 2. - new onboarding for beginners. let's them know how to turn off apple clock. how to move iclock via command drag. - installing info also updated in the manual. - added an onboarding screen that only appears once to inform beginners that they might see two clocks in the menubar when they start iclock. the 2'nd is the apple clock and how they turn it off. - final changes to the light/dark mode pref panel. now you can turn that totally off, manual (which you can switch there or in the Time Menu). Or in the two automatic modes, sunset/sunrise or scheduled. - floating clocks can now be used on 2nd, etc monitors. big thanks to all the users for suggestions and bug reports. you are plum amazing! - now set light/dark mode manually or automatically. manually can be set via pref or in menu option. automatically allows changing via local sunset/sunrise or users custom schedule. - more user interface added for switching light/dark mode manually and automatically. manual switching is now on by default. 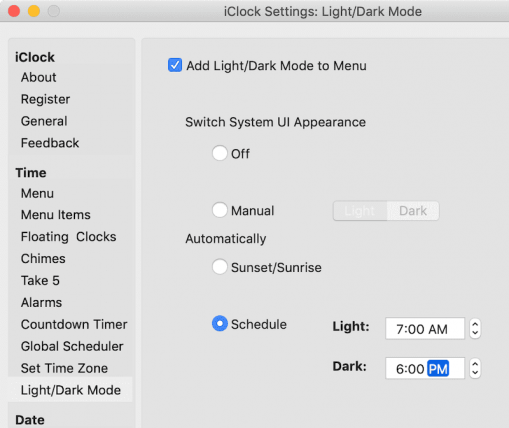 - [new] use the great dark/light mode of mac os 10.14 more fully with this iclock feature. change to dark/light mode manually, to a particular time or to sync with sunset/sunrise. try it out and give us your feedback. keep the ideas coming. thanks to all users. - added sunset/sunrise and more astronomical times in the time menu when selecting a city and then sunset/sunrise. this brings up a dialog. this may change to a panel for astro info in the pref area in future. - iclock can ask for access to the calendar now on mojave and the user can grant access. thanks to users for the great feedback, suggestions and support. - alarm time in menu now updates. - now custom date formats can be deleted in the same way as custom time formats can by using the red x. - in custom date format day of week would mess up whole custom date, now fixed. - Fixed the issue when selecting the menu option in custom date format field then it shows the selected menu item like a token not text. - sometimes, floating clocks disappeared while changing space between floating clocks. - reset to default also resets floating clocks. - fixed: time in time menubar was not shown after reset in dark mode. - floating clocks fix for time in certain locations. - new user created time formats are now added to the time menu for the menubar and for use in items in the menu. - added new iClock S app to the app store. it is the same as the shareware iClock but is a subscription version. for people who want to get it from the app store, try free 14 days and then subscribe for 0.99/month. apple gets 30% of this. - added iClock to the app store it is the same features and price but apple get's 30% of the total cost on this one too. so, if you can buy direct please do. if you like iClock please let your friends know. it does not make us rich but it does all us to keep working on these projects. thanks for the support, bug reports and suggestions. - works great in the new mac os 10.14 (mojave) especially in dark mode. 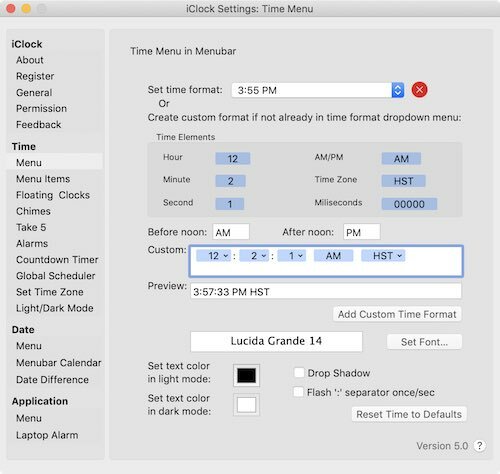 - updated floating clocks to have access to the same date and time formats that the time and date menu have. - creation of a separate iclock that is free to test and then available for inexpensive subscription instead of one time price. - thanks to users for all the feedback and suggestions. if you get a chance please put up a review on macupdate.com there is a link to do this in the app prefs. thanks. - Added subscription version of iClock for Apple Store (it will be released there as soon as it's approved. - now the location settings for floating clocks is remembered on multiple monitors. - allows moving floating clocks between different monitors. - changed ui for dialog asking about problems and suggestions to have a 'Don't ask again' checkbox. - now you can delete the photo in bigcal in addition to selecting a new photo. - bigcal size setting is remembered. this means when you change the size of the bigcal calendar and close it then reopening it will return to the last size. - floating digital clocks now shows correct time in 24 hour mode. - can now set the color for name of the month in bigcal prefs. as usual big thanks to all users for the great feedback and suggestions. - in the iclock:general preferences you can set 'check for updates' to be daily, weekly or monthly. - user interface improvements and choice of days for alarms. - now day number set more exactly in big calendar can be set any of the 4 corners or center of the day square. 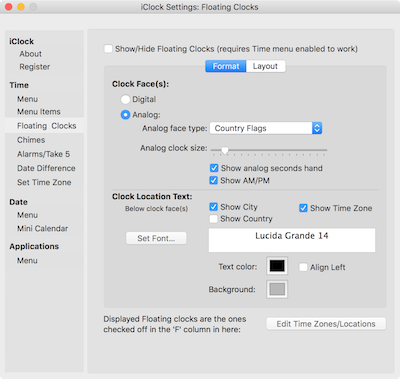 - if 24 hour time is selected in system preferences:language®ion it now shows correctly in the digital floating clocks. - removed the extra google and apple calendar selection buttons. - crash switching between apple and google calendar on some systems fixed. - drag and drop photo into bigcal calendar to add photo to the top. photo can also be selected and calendar formated in the preferences. - audio output via sound preferences goes to internal speakers first. - other misc. changes to ui. - add draggable divider on bigcal to adjust photo size, yay! - many new and better clockfaces added in floating clocks, yay! - fixed issue external ip did not updated when network changed. - many other changes, improvements, ui and bugs fixed. big thanks for all the feedback! keep it coming. if you can't install this automatically, go to plumamazing.com and install this update manually. - some people had crash opening preferences, now fixed. - fixed the error that occurred while copying 'cities and countries' plists. - appcast changed to https. - sparkle (check for updates) improved. - login items appearing multiple times fixed. - many other miscellaneous fixes and improvements. - do a manual download and install to get this version. - icon now in tinycal to launch apple calendar just like the one to launch google calendar. thanks for all the feedback. please let us know if you have some good suggestion for iclock. 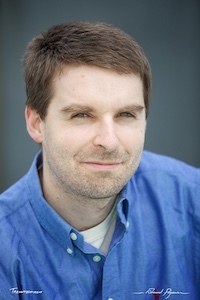 - many logins created problem, reported by joel parker, fixed. - active alarms now appear in menubar all the time they are active. - a variety of possible crashes fixed. - appearance of calendar now based on left edge of calendar or moon if that option is selected. - default date menu now black instead of dark gray. iclock is once again solid. feel free to let others know about it. - fixed the issue alarm menu was not updated after activating alarm. - time menu code rewritten to fix not highlighting bottom menu items and crash on some macs. - switching between tinycal and bigcal, calendar no longer squashed. iClock users, no need to update every day and everytime we produce a new version. A few people had a crash on opening the preferences. If you did have that issue and this version fixes that then please let us know. If you see a problem or have a suggestion now is the time to let us know. - merged in TimeMenuFix. Update timemenu on every menu item insertion. - fixed issue, didn't change font size and color of menu items in dark mode reported by user. - fixed the issue app icon is not showing in dock. - added a solution to prevent crash after sleep on some macs. - fixed the month 13 out of bounds line appearing in console log by replacing the deprecated method. - added 'Edit location' to bottom of hierarchical menus for locations/cities. - floating clocks when checked remember setting and appear on restart. - replaced the "Menu Calendar" name with "Menubar Calendar". - fixed the crash on choosing apple calendars, when apple calendar access is not granted. 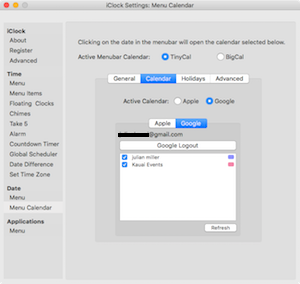 iClock has to be added to the Calendar area of the System Preferences:Security & Privacy panel. more in the manual. - show error message, if user hasn't granted apple calendar access. - fixed the crash reported on crashlytics. - fixed the locations menu color and font issue to make it symmetric. and send us some details and the crash log. thanks. 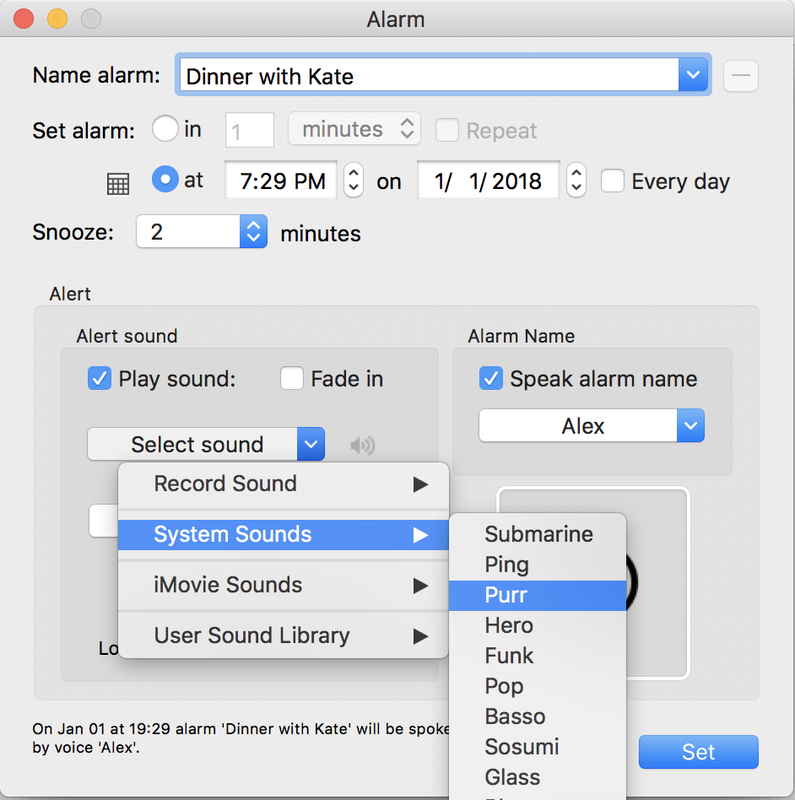 - fixed the crash when selecting the voice from alarm preferences and immediately move to other views. - improved the formatting in GlobalSchedular when sending the email. - improved ui for take5. new menus. does not start automatically with each new version. - tinycal appears under the calendar now. - fix for a crash connected with global scheduler. please give us your feedback (bugs and suggestions). thanks! - fixes for tinycal in menu calendar. please if you spot any issue, have a suggestion or issue let us know. take a screenshot. write down some details and send it in. info@plumamazing.com thanks! - iclock in this version is beta testing 1 new calendar, called tinycal that supports both Apple Calendar & Google Calendar! - [beta] in iclock tinycal support for Google Calendar + extra calendars. - [beta] - global scheduler, a way to arrange a teleconference at times appropriate for everyone in the world. the betas may be missing some functionality (not finished) but you can try them out. - updated ui on take 5. take 5 reminds people to take a break while working at a desk and is customizable for time between breaks, break time and number of times to repeat. - date menubar item now works with dark mode like time menubar item already does. - if there is any feature you want to see, now is the time to ask. - color for time in time menu is maintained even in dark mode. - improvements to the time format generator. - more sounds available and sorted for chimes, take 5 and alarms. - The Drop Shadow for the menubar shadow was changed from going up to going down from the text. - date format generator. drag blue pills to customize area. touch the dropdown menu of each to set to one of the many formats for month, day, etc. - time format generator. not perfect yet. - take 5 works better. once set in prefs can turn on and off from time menu. still not perfect. we would like to hear your suggestions. - still no color for text in dark mode. that is coming. - countdown timer added. enhanced with ability to turn red within x hours of event. - calendar now can be set to open small with one month, 6 months or 12 months. then stretched as big as your monitor or perhaps monitors. can be set on desktop or to always frontmost window or regular window. - issue with 3.5.7 moved back to 3.5.6 for now. - countdown is now found in the countdown preferences. - we appreciate all your suggestions and bug reports. - new manual. has new info on countdown timer and the calendar. 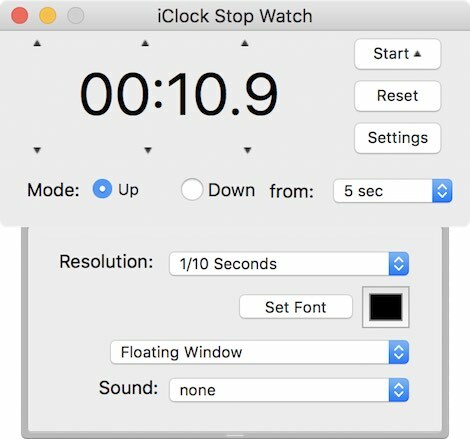 details about getting more sounds into iclock. check it out. - check for updates downloads, extracts but does not install. a manual install of new versions is still needed. - check for updates is now in the about page of the prefs and in the iclock menu. - take 5, the feature that acts like a pomodoro or break timer, is improved. ui better and bugs fixed. - for users who get the app and when opened it is not in the app folder, it asks if you want to move the app to the app folder saving users a step and keeping your mac better organized. - alarms, from our tinyalarm app, is now in iclock. - the minicalendar had it's ui improved and some fixes. thanks for your feedback. let us know if you have suggestions. - calendar can now grow from 1 month to 12 months by expanding the window. - beginning to add a new feature called 'take 5'. - all running apps show in app menu. also the recent folder which shows recently opened apps and system prefs folder. - new version now reads old registration info. - even though this is a rewrite and new version of iclock we are going to call it 3.0 to differentiate it from the previous version. - make a new pref that allows hiding the app icon in the dock. - SPARKLE (check for updates) upgraded in aop. will work in next version. - iclock picks up changes in timezone. - calendar will be replaced by tinycal in next version. - many other small fixes. Time is a kind of illusion or maya. Along with space it may be the very best of illusions. Seeing the sun rise and set convinced us for eons that the sun goes round the earth but it turns out the opposite is closer to the truth. The measurement of time was based mostly on the movement of the sun. Working from that we have made all sorts of tools to measure and display time. Sundials, hourglasses, clocks, calendars, watches, etc., It’s become an extremely complex illusion. So, what is time? Sorry, some day we would like to go into this deeper but this is not the place for that fascinating discussion. We can, however, give you a nifty collection of tools to enjoy time. When Mac OS X first came out, it had a nice clock in the menubar, but sadly it only displayed the time. Every day you needed to click the menubar to show the date. We found ourselves clicking daily in the menubar, until we thought, “enough of that” and decided it was time to make something better. Users of Mac 10.11 and higher use the ‘Check for updates’ in the File menu or in the General prefs panel. Which is the same as the version on our site. iClock requests you grant permission for Contacts. -iClock requests you grant permission for Calendars. IMPORTANT: sometimes if you have trouble with some permission and iClock is already in this area try unchecking and checking it. This may be a bug in Mac OS. Time Zone – a region of the Earth that has uniform standard time, usually referred to as the “local time”. 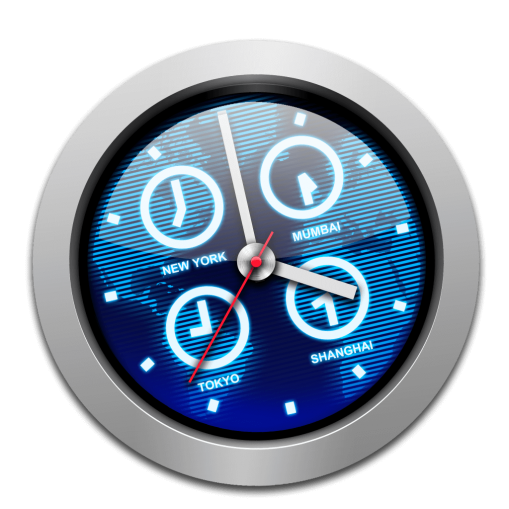 iClock allows you to see multiple time zones/locations/cities right from the menubar (image above). See info on time zones in Wikipedia. Daylight Savings Time (DST) – the convention of advancing clocks so that afternoons have more daylight and mornings have less. iClock displays the correct time taking DST into account for your location automatically. See Wikipedia for more info. Ye olde iClock first appeared in 1999 (back in the last century) for Mac OS 9. A newer version for OS X was created in 2002, yet another in 2008 and again in 2016. The earlier iClock was a continuously evolving work that developed organically based on our ideas and user requests. The latest iClock is an app that is completely rewritten but still similar to the early versions. With the latest iClock, Mark has done a masterful job at keeping all the features of the earlier versions and, simultaneously, making the interface much easier and more accessible. Now, everything is located in one place, the iClock app. The Preferences in the the iClock app has all the settings to turn features on or off. It’s simple! How To Uninstall Old iClock Pro: The old iClock was not an app but a control panel. Click for info to uninstall older versions of 1, 2.0.1 up to 3.0 for back when iClock was not an app. Install – To install download and unzip (uncompress). Double-click the app and it will move itself to your application folder. Uninstall – If you ever need to uninstall iClock, just delete the app in your Applications folder. 1. – 2 clocks showing? First time users: If you launched iClock and there were 2 clocks showing then watch this quick video to learn how to hide the old Apple clock. You can turn it back on later if you want. The second tab has the same instructions but shows the info in one graphic. 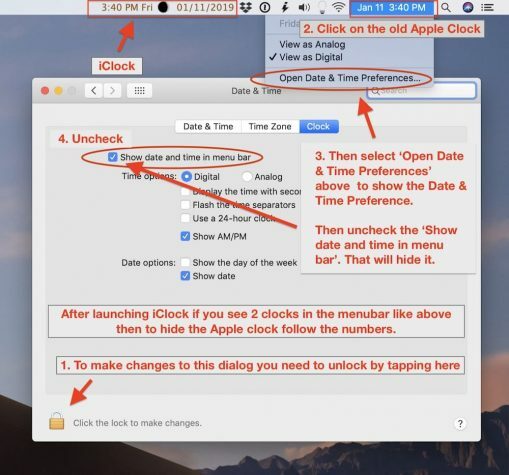 This graphic also explains how to turn off the Apple Clock.
. To start iClock automatically at login. Go to iClock preferences. 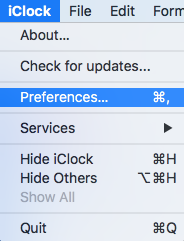 Click on the iClock Time menu and toward the bottom you will see ‘Preferences…’. select that. Go to ‘General’ and check the item called ‘Always launch iClock at startup’. Rearranging the menubar items is only possible in Mac OS 10.12 or higher. You can command drag the time menu all the way right. The same can be done for the Date and App Menu (if you turned it on). Each can be moved individually to a different area. There are 4 major major visible parts of iClock. 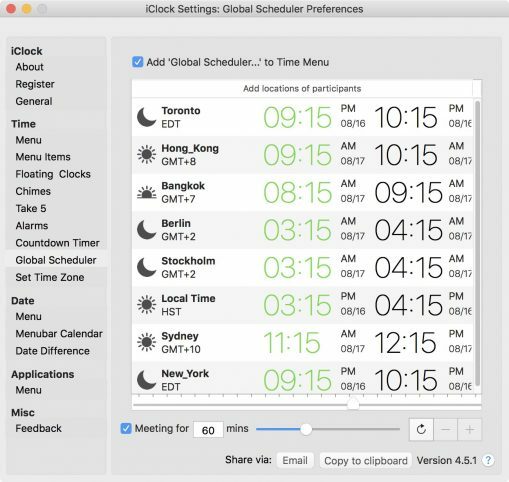 Time Menu – shows local time in the menubar and preferences on the menu can be selected. Preferences Panel – the control panel for iClock and location of all settings. Opened from the Time Menu. 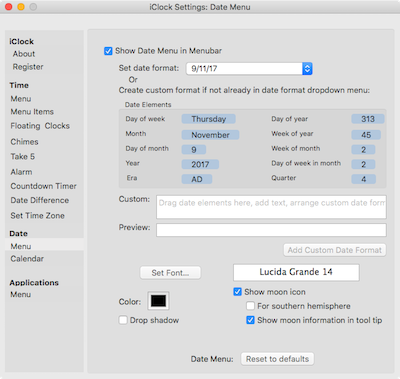 Date Menu – shows date in the menubar which when clicked reveals the calendar. App Menu – shows all active apps, recently used apps and system control panels. Once iClock is installed and open then from the Time menu you can open the Preferences. 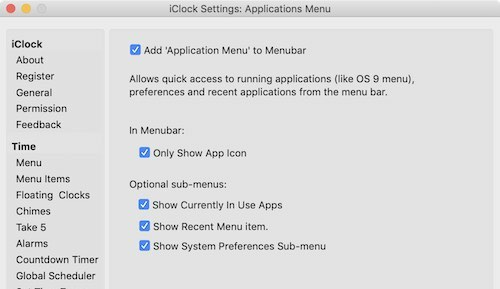 Once installed, click on iClocks Time menu and in that menuselect ‘Preferences…’ (screenshot below) to see and change the preferences for the Time, Date, and App menus. That will display the Preferences. Preferences are all in one place and look like the screenshot below. Select an item on the left side to display a panel with setting on the right. Adjust the settings to your taste. Preferences is the control panel for iClock. It’s the one place for all settings. Starting on the left side of preferences and going down thru each item, here is an explanation of each panel. This is where we put info about the creation of the app and it’s heritage. Here is where you can purchase anytime and then copy & paste the license key which unlocks the app. [ ✓ ] Always launch iClock at Mac startup – when checked will always launch iClock on Mac startup. Checked is recommended. [ ✓ ] Automatically check for updates – when checked lets you know when a new version is available. (not in Apple store version) Checked is recommended. [ ] Remove from dock – for those people who don’t want to see the iClock icon in their dock or application switcher. Unchecked is recommended. [Reset all preferences] – returns iClock to the settings/preferences when it was first downloaded. IMPORTANT: all changes, new cities and custom formats will be lost. [Open onboarding screen] – when iClock is first start this set of startup screens are shown to get the user oriented and setup. Time:Menu refers to all the settings for the time you see in the menubar. We don’t allow turning this on/off because we need to have a way to get to the preferences. Below you can find info on each setting from top down to bottom. At the top of each preference is a checkbox to turn it on/off. 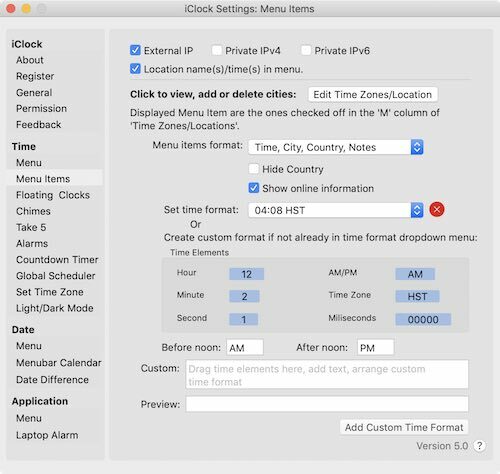 Set time format – select the time format from this dropdown menu of commonly used formats that you want to see in the menubar. The red X icon allows you to delete formats from that menu. Create custom format – by dragging the blue pills like the one that says Time Zone HST down to the field below called Custom. Once there if the pill has a downward facing triagle and choose from options like in the screenshot below. Continue to make the selection you want to make up your custom format. Tap ‘Add Custom Time Format’ and it will be added to the bottom of the dropdown menu (called ‘Set Time Format’) of commonly used formats. There you can select and use it. It is also possible to add punctuation and other characters in between the pills like a comma. The ‘Custom’ field can also take directly the unicode codes which are described in depth by tapping on this link. Those codes like, HH:mm:ss zzz can produce a result like 15:08:56 PDT. Flash separator – the ‘:’ character flashes as a visible indicator of each second. Color – change the color of text in the menubar. Drop Shadow – turn on/off drop shadow in the menubar. Set Font – change the font, size of the time in the menubar. Does not change color. Reset to defaults – if you get a little to crazy and want it the way it was. The items below apply to the Time Menu. External IP – show/hide the external IP. Internet Protocol address assigned to you by your Internet Service Provider (ISP). Select the address to copy it to the clipboard. Internal IP – show/hide the internal IP. IP Address assigned by your local network router. Select the address to copy it to the clipboard. Location Name(s)/Time(s) in menu – when checked, this will display your locations/cities with their current local time. Click to edit cities – tap this button to add and remove cities or time zones and to set which ones show up in the time menu and in the floating clocks. See checkmarked items below on the left appearing in the time menu on the right. Drag cities up/down in the pref (left) to change their order in the menu (right). Menu items format – set the format to see your cities with as much or as little info as you want. Hide Country – this will hide the country name when this box is checked. Time format – select a format or create your own custom time format. Color – set the color of the menu items. Drop Shadow – set whether to add drop shadow to the menu items. Set Font – choose the font you want for the menu items. Clock Face – select to have a digital or analog face. Analog face type – select among the different face types. Analog clock size – set to the size you want. Show analog second hand – show/hide the second hand in analog clocks. Show AM/PM – kinda obvious. 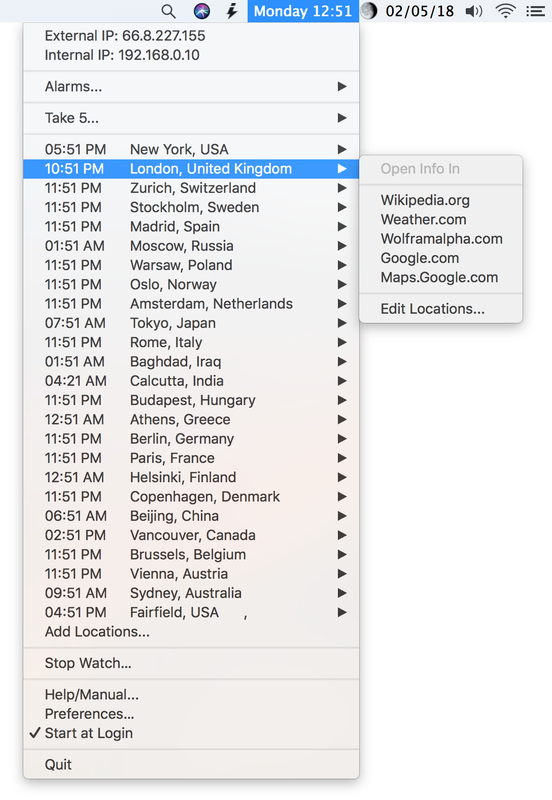 Clock Location Text – Show city, country, timezone, color, etc. – obvious. Items checked off in the ‘F’ column above will be the ones that show up in the Floating Clocks. Items checked off in the ‘M’ column above are the ones that will show up in the menubar when you click on the time. See image below. When you are finished arranging the locations, turn the Floating Clocks off and on, and it will show the new arrangements. Speak the hours, Voice – select a voice to speak the hours. 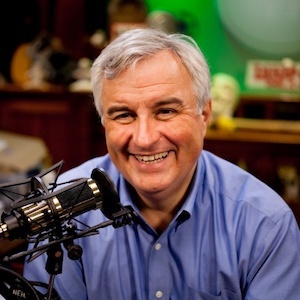 Play sound on the hour – like a grandfather clock or Big Ben. For the hour count – the hour is the number of gongs. Quiet time – no sounds play during this time. The name Take 5 means ‘to chill’, is based on English slang for take a break and also on the famous Jazz piece ‘Take Five” composed by Paul Desmond and played by the Dave Brubeck Quartet. That piece also happens to be 5 minutes long and is perfect for use with the Take 5 utility in iClock. We recommend using the tune ‘Take 5’ with the app Take 5 so it plays for 5 minutes in the background as you take a short exercise break every 30 mins. Take 5 is a timer in iClock for timing regular breaks. Breaks are essential especially if you sit at a desk or on a computer all day long. We have bodies and we forget they need to more around, relax and get exercise. Take 5 is a reminder to provide your body with maintenance it needs. “There is no pill that comes close to what exercise can do,” says Claude Bouchard, director of the human genomics laboratory at Pennington Biomedical Research Center in Louisiana, found in Time Magazine article. Tap here for some exercise suggestions that were sent to us from an iClock user and Olympian. Take 5 in iClock is also a pomodoro technique timer. What is the Pomodoro Technique? The idea of staying focused for 8 hours can seem like a daunting undertaking. The Pomodoro technique (originating from the tomato shaped kitchen timer) helps to break this chore into manageable increments. Despite how overwhelming your task at hand may sound, you can do anything if it’s only for 25 minutes. Remove all distractions: close emails, silence phone, and shut office door (if applicable). Set the Take 5 timer for 20 or 25 minutes (one “Pomodoro”). Work solely on one task, completely uninterrupted for 20 or 25 minutes straight. Once the time goes off, give yourself a short break, maybe 5 mins (ie. get a drink, stretch, walk around, or meditate). After completing four “Pomodoros” give yourself a longer break of 20 or 30 minutes to rest your brain before the next round. Take 5 can help protect your vision. Use Take 5 to provide a break for your eyes. Follow the 20-20-20 rule. Look away from your screen every 20 minutes for 20 seconds at a time and focus on a fixed point 20 feet away. Set up Take 5 to follow the 20-20-20 rule when using computers all day. 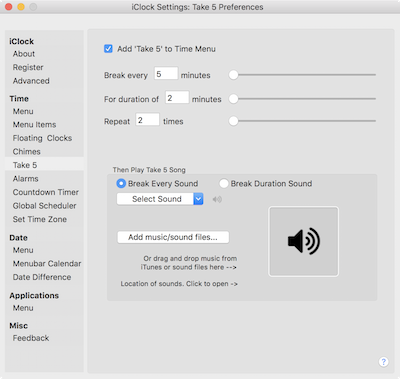 Turning on/off “Add Take 5 to Time Menu” – adds ‘Take 5’ to the Time Menu. When on you get a link to Start, Stop and Preferences. Settings for the break, duration and number of times to repeat the sessions. Sounds for Break Beginning and Break End. TIP: Remember ‘Take Five’ by Dave Brubeck is a great MP3 you can use for a Break every sound (break length). 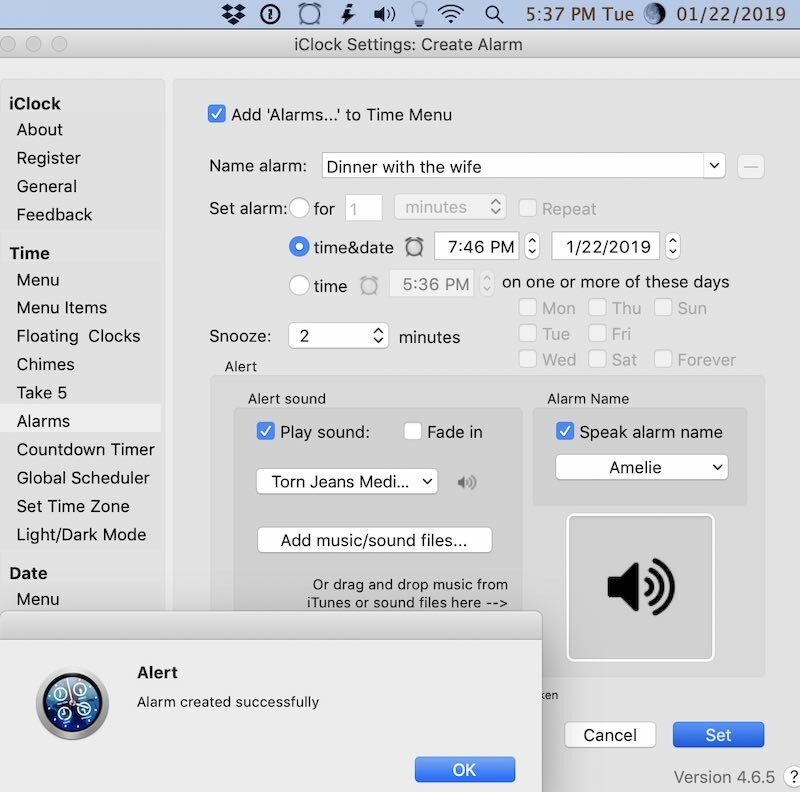 A checkbox to turn on/off the display of “Add ‘Alarms…’ to Time Menu’ to the Time Menu. Below this you can name, set the time, date and sounds for an alarm. Set a time to countdown to. Example enter Dec. 31, midnight for New Years. Countdown resolution – like days, hours, mins., secs to see a countdown timer. Display window – can open the countdown window each time you login, wake from sleep, either of those. Within days – put the number of days before the event that you want to start seeing the coundown timer. 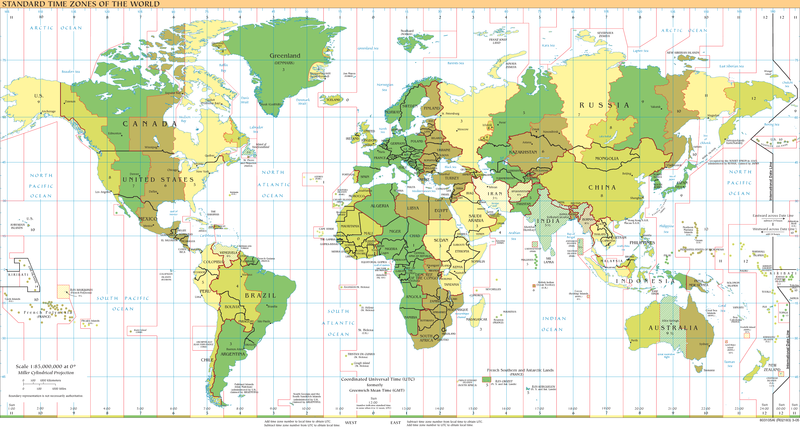 A tool to help any arrange a multi-timezone teleconference. Have you ever had to arrange conference call with people in many different timezones? It can be very challenging figuring out how to connect with 3+ people in different locations and not catch them at lunch, dinner, asleep or just getting up. Global Scheduler is the tool to arrange this in the quickest and easiest fashion. The stopwatch part of iClock allows you to count up, count down (from a set amount of time), stop, reset and change the settings. The settings look like this screenshot on the right. Start – start and stop with this button. Reset – resets everything to 0. Resolution – set the accuracy of time resolution. Set Font – set the color of the font used for displaying the numbers. Floating or Normal Window – dropdown menu allows selecting a normal window which allows Stopwatch window to move around from the front to the back layer of windows. Or select floating window to have it always on top and visible. 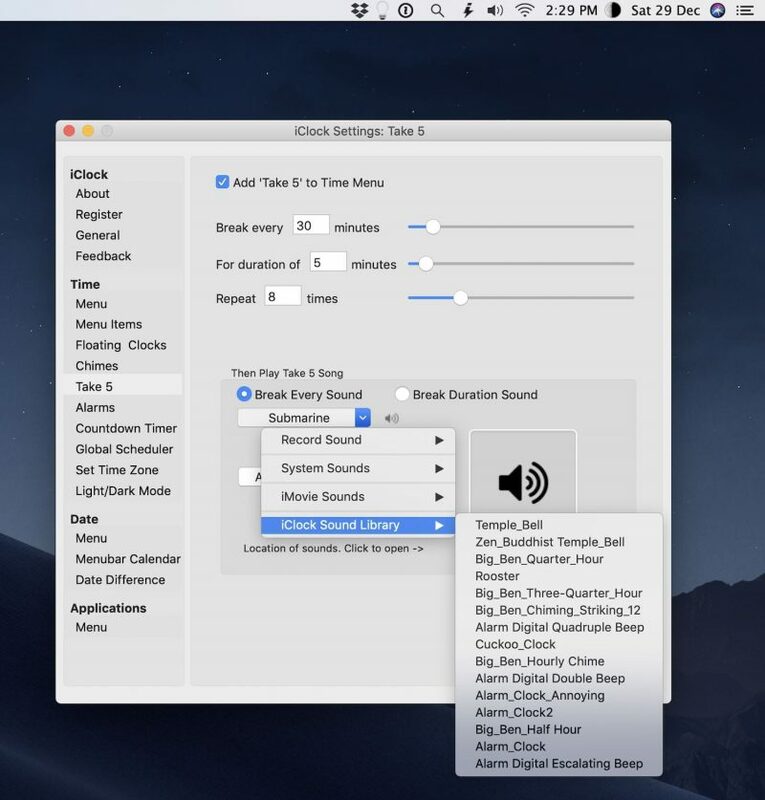 Sound – allows select one of the many sounds to play when countdown reaches 0. 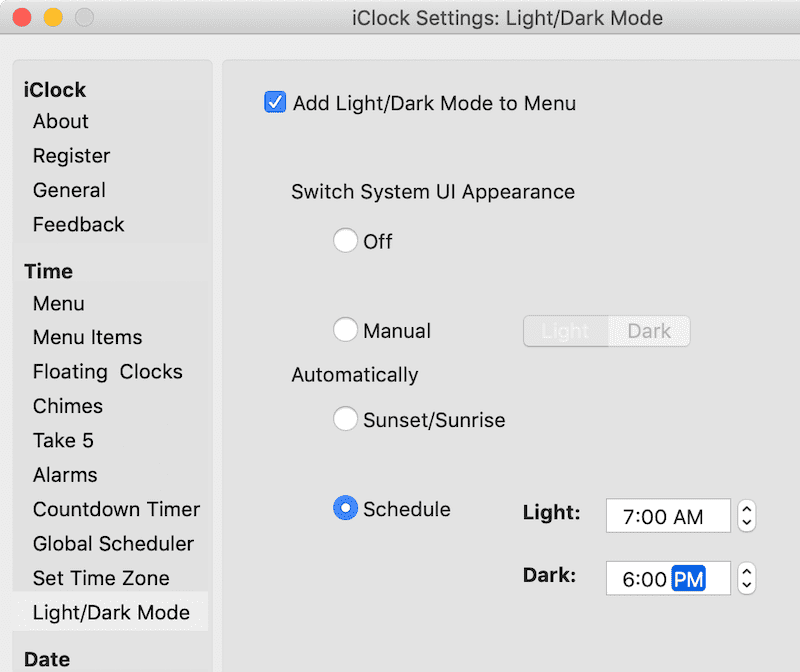 Apple’s Dark Mode adds a fresh new option to the Mac appearance….but it doesn’t give you a quick way or an automatic way to switch from light to dark mode. iClock controls time, now it allows controlling Light/Dark Mode within time itself !!! Automatically switch to Light at sunrise and Dark at sunset to save your eyes. Automatically switch modes at a custom time. Or switch manually via an iClock menu item from the menubar. The above preference in iClock is for switching and automation of Apple’s Light/Dark Mode. Add Light/Dark Mode to Time Menu – allows adding it to the Time Menu making it a very convenient way to switch modes. Do it. This is very handy. System UI Appearce – allows immediate switching in the pref to light or dark. Switch Appearance At – gives 3 methods to switch modes. manually (which shuts off any automatic mode previously set). Very similar to setting the time in the menubar above. Set Date Format – select from the dropdown menu any of the commonly used date formats. Create a custom format – by dragging the blue pills like the one that says Thursday down to the field below called Custom. Once there if the pill has a downward facing triagle and choose from options like in the screenshot below. Continue to make the selection you want to make up your custom format. 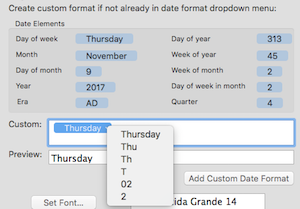 Tap ‘Add Custom Date Format’ and it will be added to the bottom of the dropdown menu (called ‘Set Date Format’) of commonly used formats. There you can select and use it. It is also possible to add puctuation and other characters in between the pills like a comma. Another option is to type the Unicode date codes directly into the ‘Custom:’ field. Those codes like, yyyy.MM.dd G ‘at’ HH:mm:ss zzz can produce a result like 1996.07.10 AD at 15:08:56 PDT. Above typing the Unicode Date Codes cc dd-LL-yy directly into the ‘Custom:’ field you get in the preview the format you can add to the date format presets menu. That one is handy for those in Europe. Here you can set the calendar that appears when you tap on the date in the menubar. You can select TinyCal or BigCal. TinyCal: is small. It can show 1 to 12 months. It can show your events, holidays and other items that Apple or Google have in their calendars. For most people’s purposes TinyCal is perfect. BigCal: it is resizable. It can be have it’s background, days, dates, in different fonts, colors and sizes. It is not possible to show events presently. You can use BigCal as a printable calendar. After selecting the calendar you want to appear when you tap the date in the menubar select either the Apple or Google calendar. For Google Calendar: select Google and login. It will open your browser and request your Google credentials to give TinyCal permission to show you your Google Calendar info. For Apple Calendar: select Apple. To use the Apple Calendar you need to give it permission in Security & Privacy System Preferences panel. 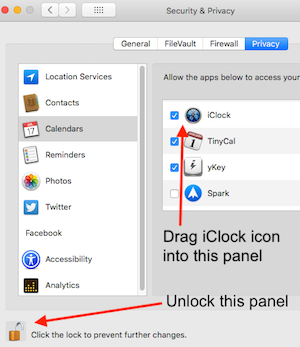 To do that open that panel, unlock it and drag iClock’s app icon to the Calendar area of the System Preferences:Security & Privacy panel. Seen in the screenshot below. Select a beginning and ending date and you get both the numerical difference and a human phrase for that length of time. Enable Application Menu – turn on/off a new menu that contains all active applications. Select an application to switch to it. Only show app icon – instead of the name just show the app icon. Show currently in use apps – show active apps sub-menu. Show recent apps – show the most recently used apps sub-menu. Show system preferences sub menu – show the system control panels sub-menu. The app menu looks like above right screenshot. 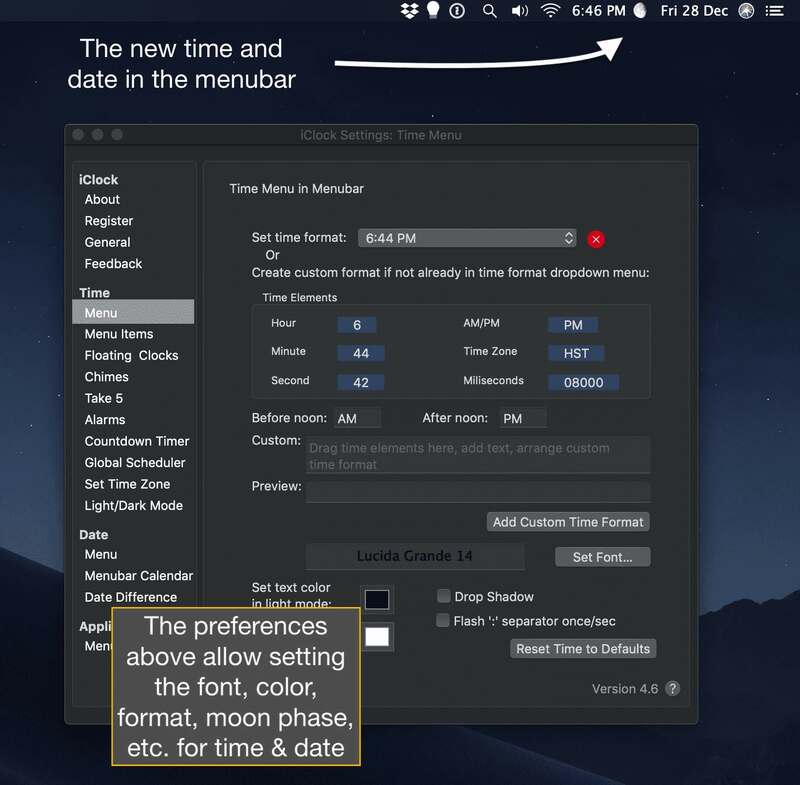 Time Menu – if you select the time it looks like this (right). It shows local time in the menubar. In the menu below it can display Internal and External IP, a list of cities with local time worldwide, Alarms, Take 5 and more. Some items are on by default, many are not. To adjust was is displayed in the menubar and in the menu below go to the preferences panel. The preferences panel can be selected from this menu. You can see Preferences highlighted below in this screenshot. Date Menu – shows the date in the menubar. Click on it to show the calendar. 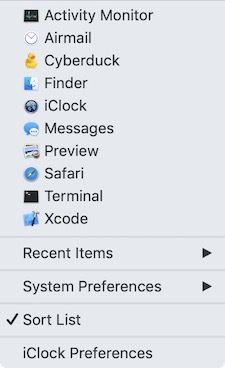 Application Menu – shows which applications are running and can optionally show recently used apps and system preferences. This could be useful for laptop owners who’s office is in a Starbucks or other coffee shop. Or in a restaurant or airport and they need to use the restroom or to talk with someone and don’t want to keep their eye on their laptop every moment. The way it works is you plug in your laptop. Checkmark the ‘Power Disconnected’ checkbox in the screenshot (above) and one of the sounds will go off when you (or someone else) disconnects the power. The sounds are earsplitting (depending on how you set the volume) and this feature is experimental so we recommend trying it out yourself. Learn how to disarm it quickly. All it takes to test is pulling the cord then… Ah Ohhhhh Gaaaa !!!!! Q: How can I have the several floating clocks I use (desktop mode) appear in order of their time zones? 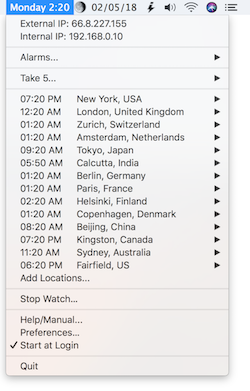 A: In the button Time Zones/Locations seen in the screenshot below you can drag the locations into any order you want to have them display. The ones in the F column are the ones that are displayed for the floating clocks. Q: How do I uninstall iClock? A: It’s an app just remove the app. Q: Where are the files located? Q: How do I make iClock not appear in the dock or the application switcher? 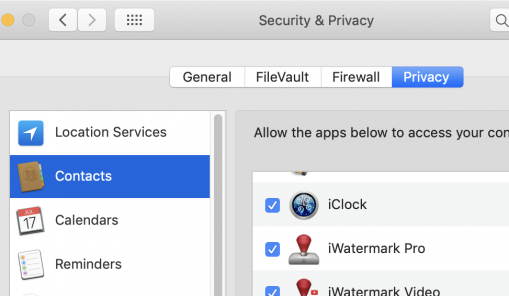 A: Go to the preferences and to iClock:Advanced and there is a checkbox there that if turned on will make iClock not appear in the dock or the application switcher. Q: How do I set the clock for 24 hour time? 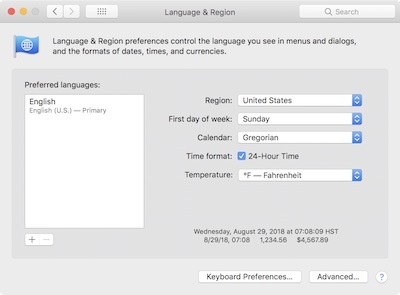 A: In the system preferences:language&region panel, checkmark the ’24-hour-time’ item seen here. 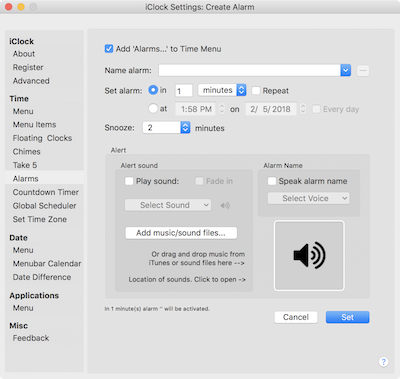 Q: How do I turn off the Apple Clock? 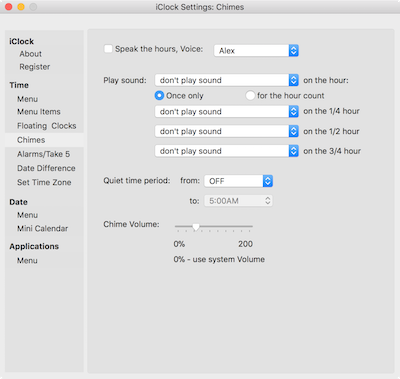 A: This is the system preference panel where you turn off the Apple Clock. 2. 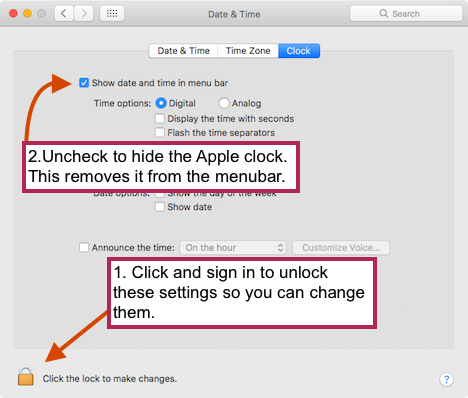 Uncheck the “Show date and time in the menu bar’ settings to turn off the Apple clock. Q: The ‘Start at login’ doesn’t seem to work. Go to the System Prefs:Users&Groups:Login Items and delete all login items for iClock if there are any. 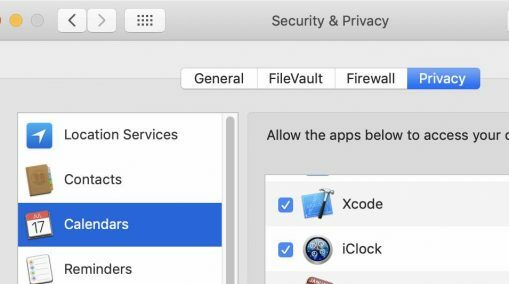 Then with both still open in iClock turn on ‘Always launch at Mac startup’ and look in the System Prefs:Users&Groups:Login Items and you will see the iClock item appear. Turn on/off a few times the iClock General pref ‘Always launch at Mac startup’ and you will see an iClock item appear and disappear in the System Prefs:Users&Groups:Login Items showing it is now fixed. From Plum Amazing iClock offers a free 30-day trial. It continues to work fine after 30 days but after the free trial purchase the app to support it’s continuing evolution. Previous users will also be given special pricing. Purchasing in quantity reduces the price in our store automatically. A license key to remove the reminder dialog and the splash screen. The knowledge that you are participating in the evolution of iClock. After registration, users automatically and immediately get an email from us with details and a license key (link) to unlock iClock easily. We love to hear from you. Please let us know your suggestions and bugs here. Email us with your rave. “I tried iclock because I was annoyed with not being able to see the date in the bar. When I went to pay for it, I noticed copypaste and decided to try it because I frequently want to do a little fancier copying. I probably won’t use the more advanced options, but I want the simple things to work well. Thanks Ed.” – Dr. Edward Catmull, one of the co-founders of Pixar. He was President and CTO of Pixar and now is President of Walt Disney and Pixar Animation Studios. “With my line of work, I never know what distant corner of the world my job will take me. iClock’s simple, intuitive interface never lets me down. With a quick glance at the pull-down menu, I can see what time it is where I am….where I’m going…and where I’ve been. With another click, I can check the weather at my next destination. 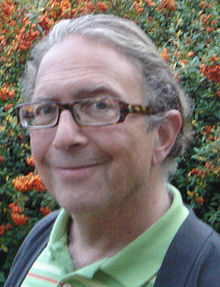 Its so much more than a digital timepiece for the Mac.” – Kevin Rafferty, visual effects supervisor “Fantastic Four: Rise of the Silver Surfer”, “Star Wars: Episode I – The Phantom Menace”, “The Lost World: Jurassic Park” and many other movies. “It’s hard to imagine that so much functionality could be packed into a ‘clock’!” – Guy Kawasaki, Author, Blogger, Evangelist, and Entrepreneur. “Best time I ever had!!! 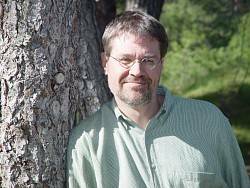 !” – Charles Henry, PanTech Inc. If you prefer buying on the Mac App Store, iClock has 2 Versions Available. Buy Paid Version – same $18.00 price as buying from our store. Both are exactly functionally the same as the version available here on Plum Amazing. 30% of the price goes to Apple. Sometimes it takes us a few days longer to get a version released by Apple.